Conventional wisdom holds that if we work hard we will be more successful, and if we are more successful, then we'll be happy. If we can just find that great job, win that next promotion, lose those five pounds, happiness will follow. But recent discoveries in the field of positive psychology have shown that this formula is actually backward: Happiness fuels success, not the other way around. When we are positive, our brains become more engaged, creative, motivated, energetic, resilient, and productive at work. This isn't just an empty mantra. 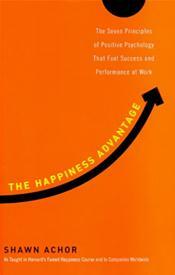 This discovery has been repeatedly borne out by rigorous research in psychology and neuroscience, management studies, and the bottom lines of organizations around the globe....A must-read for everyone trying to excel in a world of increasing workloads, stress, and negativity, The Happiness Advantage isn't only about how to become happier at work. It's about how to reap the benefits of a happier and more positive mind-set to achieve the extraordinary in our work and in our lives.